November in London conjures up pictures of rain-soaked citizens, fog cloaking the Thames, and ever-shortening, darkening days. But in one corner of the big city, bright lights abound: From 15-22 November, tennis’ top men’s players will battle it out at the O2 arena to become the 2015 Barclays ATP World Tour Finals champion. The sport’s commentariat are already abuzz about what is set to be a hotly-contested tournament. Will the seemingly ageless Roger Federer break his own record and win the Finals for a seventh time? Could Novak Djokovic become the first player in history to capture four consecutive Barclays ATP World Tour Finals singles titles? Or could Andy Murray storm to victory for the first time? The ATP World Tour Finals are reserved for the top eight singles players and doubles teams of the ATP rankings, meaning the attendees will be treated to displays of tennis prowess from the cream of the crop only. Additionally, it’s the most prestigious ATP tournament after the Grand Slams, it’s the final event of the tennis season, and it often determines the year-end No 1 ranking, all of which add an extra frisson of excitement to the proceedings. Knock-out tournaments are what tennis is known for, but the ATP World Tour Finals offer something gloriously different. Eight players/doubles teams are divided into two groups of four, and play three round-robin matches against all other players/teams in their group. Two from each group progress to the semifinals, before the finalists meet to battle it out for the title. London’s hosting contract for the World Tour Finals expires upon the end of this year’s tournament, and speculation has been swirling all year about whether the O2 will secure the tournament beyond 2015. The tournament has flitted from venue to venue since it burst onto the scene in the 1970s, so 2015 could see the O2 arena wave farewell to the finals- It’s history in the making. 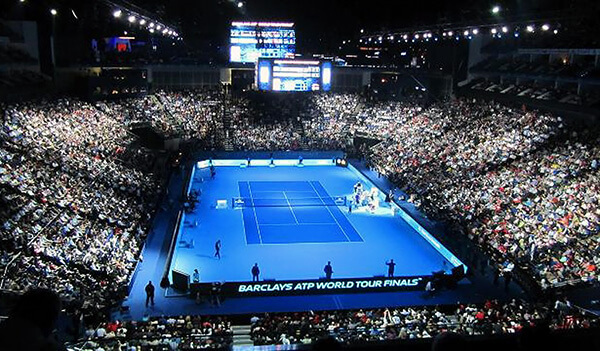 First to the records: An astonishing 263,560 tennis fans attended 8 days of competition at the 2014 ATP World Tour Finals. And Roger Federer withdrew from the final due to injury, marking the first time in the tournament’s history that a finalist didn’t play. Now to the revelry: Andy Murray sped from his home in Surrey to save the day -and the final- by playing a light-hearted, humour-filled exhibition match against Novak Djokovic. And Murray, Djokovic, Pat Cash and John McEnroe put in a spirited doubles exhibition complete with glimpses of McEnroe’s famous skill and infamous temper. What could possibly be in store for 2015? Forget having to deal with the endless queues and weather washouts of Wimbledon. The O2 arena has long shaken off its white elephant reputation as the Millennium Dome, and now hosts world-renowned acts and events on a regular basis. The arena offers VIP experiences, endless mouthwatering food and drink options (you can’t take your own refreshments, unfortunately), and a layout which ensures that no matter where your seat is located, you’ll enjoy a sublime view of the action. Why not complete this once-in-a-lifetime experience with chauffeured transportation to the venue? Perhaps you need to impress an important client, want to treat your tennis-mad family, or simply yearn to kick back and relax without worrying about the logistics. At Mercedes Chauffeur Hire, we promise to serve up the perfect option for you.